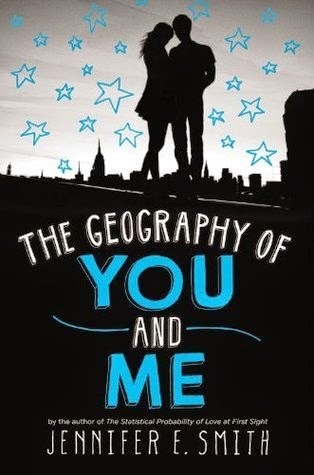 The Geography of You and Me is probably my second favourite of jennifer e. smith's books; this is what happy looks like being my favourite. i think what drew me to this book was its freshness. it was written well, the characters made me love the book even more. the only thing that irked me slightly at one point was the repetition of "in [country], owen/lucy [verb]". one one level i thought it was clever, the way the author mirrored their lives and reduced them to action verbs to vivify their emptiness and make it feel more realistic. but the repetition also made me feel a little disgruntled at times as i felt like the chapters needed different beginnings otherwise there was the danger of them all blending into one. overall however, i loved it. the whole idea behind the story, the characters, the quirky things they both did. [i really really want someone to send me postcards now. i loved them before but this book emphasized and highlighted my love for them]. something i would loved to have seen in this book would have been the postcards themselves. instead of text indicating the message, i think it would have added a little extra something to the book if the postcards they had sent each other had been replicated and dotted around the pages. if you don't mind reading fluffy books once in a while then jennifer e. smith's are the ones for you. because while the plot is interesting enough, the endings are always rather unrealistic . so if this type of book annoys you: a fairytale-esque story with a definite probability of a happy ever after - then i wouldn't advise you to pick up this book. however, once in a while it's nice to read something that doesn't involve blood and death and fighting for survival right? many thanks to bookbridgr and headline for providing a copy of this book for review purposes.